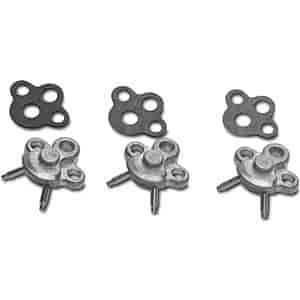 Edelbrock Carburetor Tuning Accessories For Performer and Thunder Series Carburetors - Everything you need to keep your Edelbrock Carburetor Performing at Peak Efficiency. A number of Edelbrock tuning components are available from JEGS. 1475 - Edelbrock Tuning Accessories For Performer and Thunder Series Carbs is rated 5.0 out of 5 by 2. Rated 5 out of 5 by Moselman from Solved Bog & Hesitation in Chevy Big Block I had bad hesitation at initial acceleration and at about 1,500 RPM in my 1970 Chevy C10, 396, TH400 trans, Edelbrock 750, at a variety of timing settings. I used the .043 nozzle. Though they shaved the mis-marked stamp off, I blew through it and it was clearing more than the other two. The nozzle nearly cured the hesitation. I also used the strongest metering rod spring and that did the trick. Both were really easy to install. Edelbrock tech reps advice was spot on. Rated 5 out of 5 by Tbone 383 from What I was looking for. Edelbrock carb never ran the way I expected. Rebuilt it with the kit I purchased along with the (squirters) and it has NEVER ran smoother. They do not run as expected out of the box as advertised. She does now!